I have my breakfast in front of the computer, more often than not. Usually, it is a bowl of cereal, however, I sometimes will have toast or raisin bread. 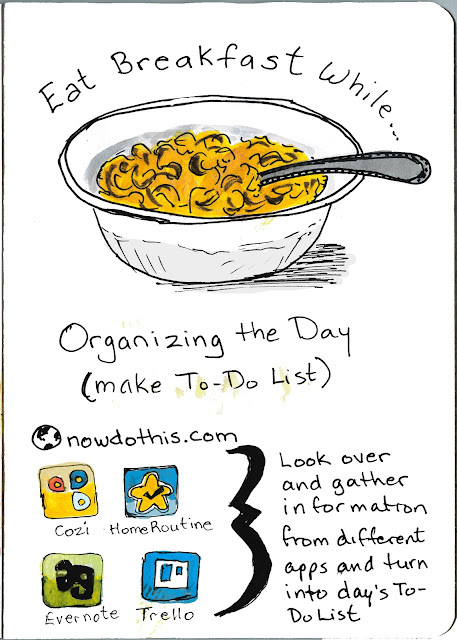 While I eat breakfast I organize my day. 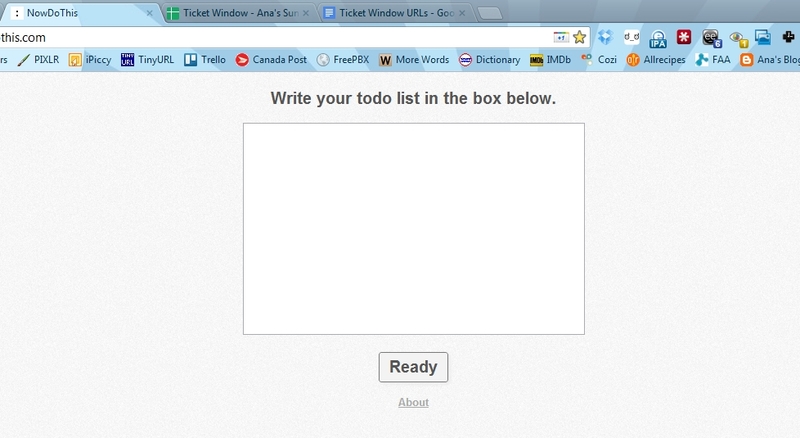 I used NowDoThis.com to set up a bunch of tasks that need to be done. I grab the information from the different apps and calendars to organize my work day, my housework, and my drawing time. I find I am most productive when I set up my To-Do list / schedule this way. 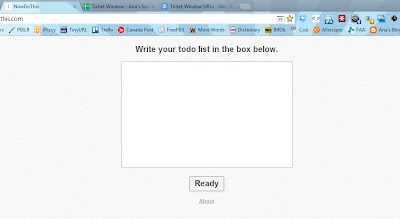 NowDoThis is a simple website in which you add the tasks that you want to do in the order you want to do them in. 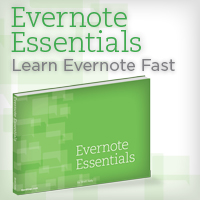 I have tweaked my list several times to find what works for me and I keep a copy of the list in Evernote that I can copy and past it into the NowDoThis window. I tweak it some more for a particular day, then go for it. 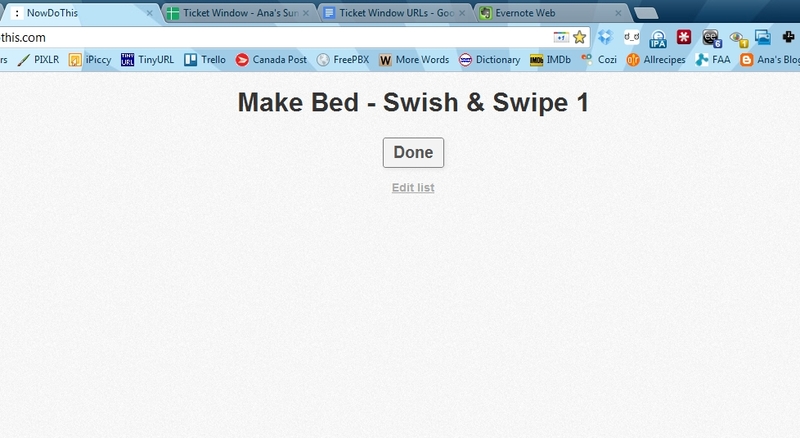 Click on the Edit List link and this window comes up. 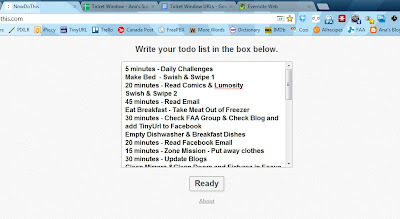 Write your To-Do list in the box in the order you want to do it in. You can copy and paste it from another program such as a Word file or an Evernote file. 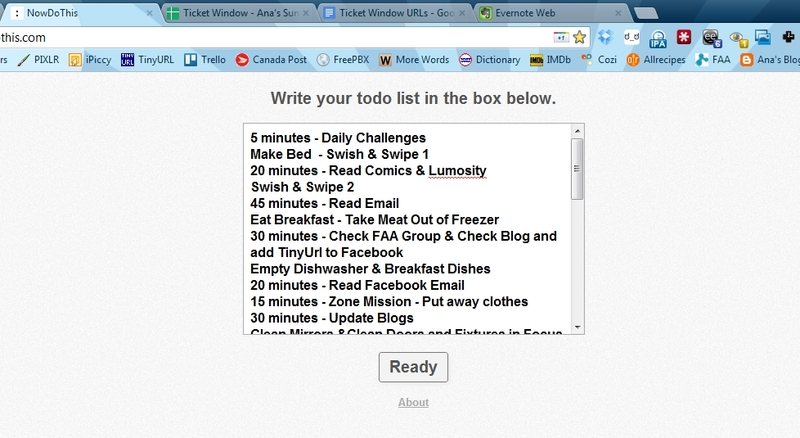 You can edit the list throughout the day if you find that you need to change the order or add/remove tasks. 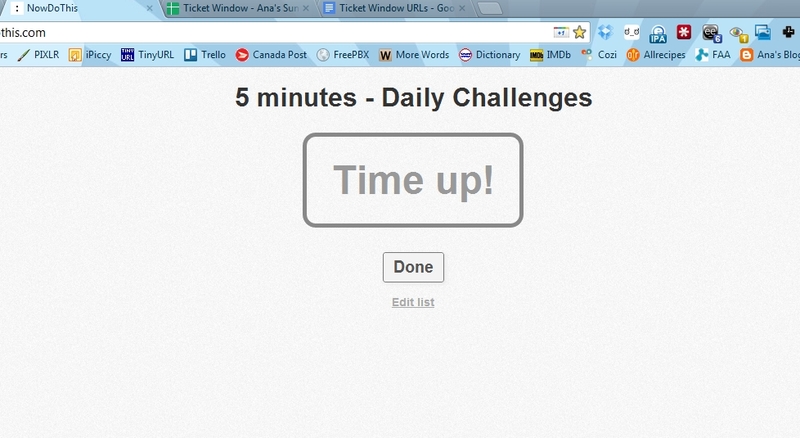 Click Ready button when your list is complete and you want to start. If you add a time to your list, as above, NowDoThis will give you a simple count-down timer. 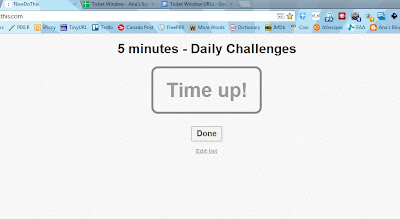 Click Start when you are ready and it will start to count down. View of the count-down timer. When your time is up, you will hear a "ding". You can then click the Done button. The next item in your list will pop up. I did not add a time limit to this item so no count-down timer showed up. I will click the Done button when I finish this and the next item on the list pops up. I usually alternate between a computer task and a non-computer task to force me to get up often throughout the day. You can have several timed items in a row if you want to control your computer time. 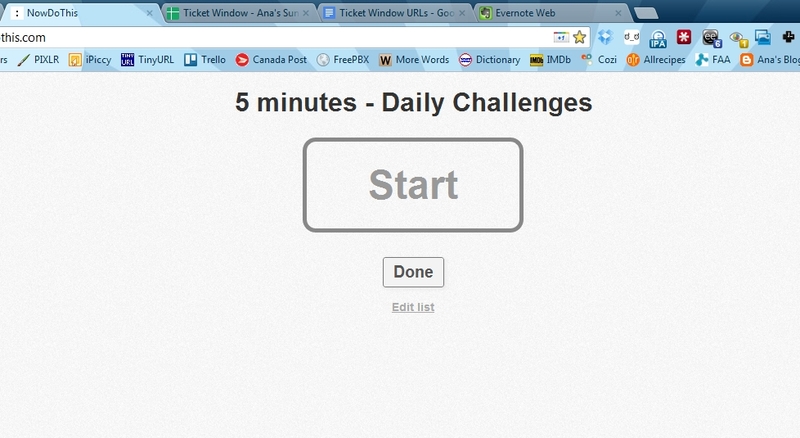 For example, 30 minutes - read email; 30 minutes - facebook; 70 minutes working on book project; etc. 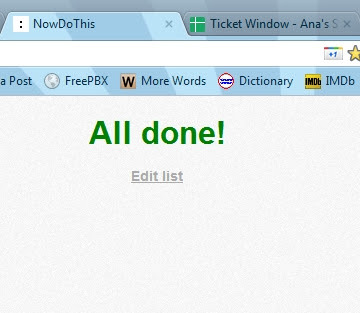 When you complete everything on your list you get this very satisfying All Done! message. I try to organize my day so that I get a certain amount of housework completed before 9:00am, which is when my work day starts. I then include a few housework items that take only a few minutes here and there in order to get off the computer and stretch my legs. I have all my regular task, computer and otherwise, completed early in the day so that I have the rest of the day to do creative work with no time limits. 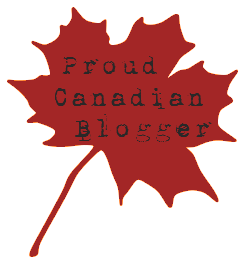 You may also view my uploads on my Art House Co-op profile for The Sketchbook Project 2013.